Check out the NEC (Netherlands) / VTech partnership that's giving Hilton Worldwide a greater choice of both SIP and Analog phones. Read how one of Australia's leading hotels found a VTech hospitality solution that met its high technical and aesthetic standards. In an alliance with Jive, one of the hottest companies in Hosted VoIP and Unified Communications, check out how VTech hotel phones were the perfect telephony solution. Learn how a premier California resort integrated a VTech cordless and corded telephony system into its VoIP technology requirements. Dan Seale, president of VTech's hospitality division, explains how innovation plays an important role in aesthetic appeal and guest convenience. As seen in Hotel Business, Hotels, and Lodging magazines. VTech Communications Limited, a leading global manufacturer of telephones for the hospitality industry, has partnered with Yeastar®, a leading provider of hosted and premise-based VoIP PBX and VoIP Gateways, to offer a reliable and proven communications solution. VTech Communications, Inc., a global leader and manufacturer of SIP-based phones, has completed interoperability testing with the Metaswitch® Multimedia Telephony Application Server (MTAS) to obtain Metaswitch Mosaic Partner Certification. Gleneagles, one of the world’s most renowned hotels has selected VTech’s Contemporary Cordless and Corded phones for its 232 luxury bedrooms, suites and lodges. Gleneagles commissioned telecom supplier and hotels specialist Orbiss of Truro to supply a choice of stylish and functional handsets that blended in with their mixture of modern and traditional guestroom interiors. Edgewater Networks, the leader in Network Edge Orchestration, today announced that it has certified its Network Edge Orchestration platform with ErisTerminal® SIP deskset phones and ErisStation® SIP conference phones from VTech Communications, Inc., a global leader and manufacturer of SIP-based phones. VTech-certified models include VSP736, VSP608, VSP600, VSP726, VSP715, and VCS754 in a Broadsoft®-hosted environment. The results are documented in a standard configuration guide for easy deployment and integration. netsapiens, a provider of unified communications services and feature-sets to service providers and large enterprises, announces today the official certification of 11 VTech® ErisTerminal® and ErisStation® SIP phones. VTech Communications, Inc., a global leader and manufacturer of SIP-based phones, delivers full-featured products at accessible prices. Epygi Technologies, Ltd., a worldwide provider of awardwinning IP PBXs and gateways, and VTech Communications, Inc., a global leader and manufacturer of SIP-based phones, have partnered together and certified interoperability. Flowroute Inc., the leading provider of advanced calling and messaging services for SaaS-based companies, today announced successful interoperability certification with VTech, a global leader and manufacturer of SIP-based phones. The certification efforts verify compatibility and document configuration recommendations for VTech’s SIP-based ErisTerminal® business and ErisStation® conference phones used in conjunction with Flowroute’s communications services. VTech joins the growing list of elite technology companies that have achieved certified membership in the Flowroute’s Technology Partner program. EarthBend, a premier value-added distributor of business telecommunications and IT solutions, today announced it has expanded its distribution portfolio to include two new business communications product lines from VTech Communications Inc. The addition includes the advanced ErisStation® conference phones and the highly affordable collection of ErisTerminal® SIP phones. VTech Telecommunications Limited, a wholly owned subsidiary of VTech Holdings Limited (HKSE: 303), today announced that all of its hospitality SIP phone models and accessories will now be available through Thing 5’s cloud-based IP PBX offering, T5 Voice. Internet telephony service provider (ITSP) Callcentric announced today it has completed certification testing for IP desk phones and DECT cordless IP phones from VTech, the world’s leading manufacturer of cordless phones. Business customers worldwide who use Callcentric’s VoIP phone services can easily install and use any of VTech’s ErisTerminal SIP phones and enjoy a superior user experience. VTech Telecommunications Limited, a wholly owned subsidiary of VTech Holdings Limited (HKSE: 303), today announced that its series of SIP phones created specifically for the hospitality industry have been formally certified by BroadSoft, the leading global provider of Unified Communications and Collaboration (UCC) services, validating that the phones are interoperable with the BroadWorks SIP interface. VTech Telecommunications Limited (VTech), a wholly owned subsidiary of VTech Holdings Limited (HKSE: 303), and Dubai-based Excel Distribution FZC (Excel Distribution) today announced details of an exclusive distribution agreement for VTech’s growing range of hotel phone products. PhoneSuite Solutions, Inc. and VTech Telecommunications Limited (VTech), a wholly owned subsidiary of VTech Holdings Limited (HKSE: 303), today announced a strategic alliance for the Caribbean & Latin American Region (CALA). Under the alliance, PhoneSuite Solutions and VTech Hospitality will provide a bundled solution for the hospitality industry in the region. Guest-tek™ has recently partnered with VTech Telecommunications Ltd., a leading manufacturer of telephones for the hospitality industry. Bringing two advanced technologies together, VTech’s renowned Guest Room Telephones have now been inter-op certified on Guest-tek’s OneView Voice iACT solution. VTech Telecommunications Limited (VTech), a wholly owned subsidiary of VTech Holdings Limited (HKSE: 303), and UK-based Purple Networks Limited (Purple Networks) today announced the signing of an agreement on the distribution of VTech’s hotel phone products. VTech Telecommunications Ltd., a wholly owned subsidary of VTech Holdings Ltd. (HKSE: 303), today announced that their line of Session Initiation Protocol (SIP) Hospitality phones have been certified as compatible by Phybridge, for Phybridge’s patented UniPhyer and PhyAdapter products, for a complete end-to-end communication solution for hotels and universities migrating to Voice over Internet Protocol (VoIP) technology. VTech Holdings Ltd (HKSE: 303) today announced that it has completed installation of SIP phones in the luxurious new Octavius Tower™ at the famed Caesars Palace® in Las Vegas. Percipia will now carry VTech’s analog and SIP corded, cordless and trimline phones for hotel guestrooms. DCI will now carry VTech’s analog and SIP corded, cordless and trimline phones for hotel guestrooms. VTech® enters hospitality market, bringing 25 years of telephony experience. Innovative new product line helps hotels provide enhanced functionality and ergonomic design for guests. Form and function come together in VTech SIP hotel phones—a palette designed to meet the needs of everyone from management and maintenance staff to the most demanding road warriors. Learn how these phones are helping the world's leading hotels deliver service continuity, control costs and make administration easy. As one of the primary touch points between a hotel's guests and its services, the guest room phone can truly impact the guest experience and the hotel's brand value. 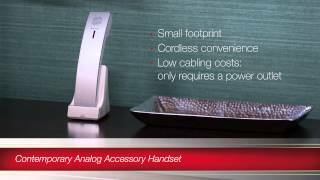 From hands-free mobility and compact footprints to guest safety and lower installation costs, VTech cordless hotel phones keep everyone better connected. From the guest room to the lobby, VTech corded and cordless phones are upgrading the guest experience in hotels around the world. That's thanks to innovative design and engineering, world-class service and support, and a commitment to the greenest standards. Meet the company that's changing the future of hotel phones. For more than 35 years, VTech has designed and delivered market-leading cordless phones. Learn how we've leveraged that expertise to innovate a comprehensive palette of contemporary and classic hotel phones. David Waterman, VTech's design director, will walk you through the strategy and behind-the-scenes details that go into building VTech hotel phones. It's more important than ever to provide guests with conference spaces that keep them connected. 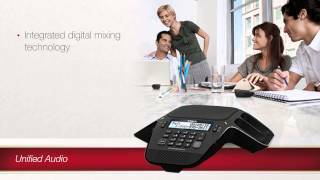 The new VTech ErisStation™ conference speakerphone is a PBX-compatible system with four microphones and interference-free sound, designed as a high-quality audio conferencing solution that allows participants to spread out and stay engaged.